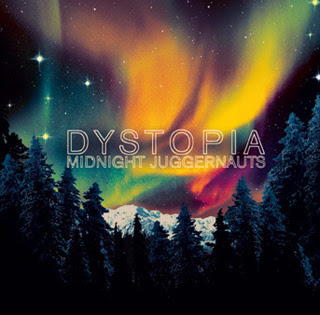 Midnight Juggernauts are an indie-electro-synth group from Melbourne.Their debut album, “Dystopia”, was released in Australia on August 4, 2007, with an international release to follow at a later date. The album was previewed by radio station Triple J as the "Album of the Week". Vincent from the band has provided Triple J with previews for most of the tracks, citing Electric Light Orchestra as one of their influences, a key sound in some of their tracks, particulary “Into the Galaxy”. Singles released by the group include “Raised By Wolves”, “Shadows”, “Road to Recovery” and “Into the Galaxy”.